CutList Plus is an automated sheet layout shareware tool. You input the rectangular dimensions of your project and it will lay them out onto 4'x8' sheets, taking as many sheets as needed to lay out the complete project. The program assumes a standard sheet, but you can easily add other dimensions (for example 1"x10"x8' boards) and it will lay out for those too. The program also allows you to specify the kerf for each material. The program assumes that any particular material will always have the same kerf, and the initial estimate is 1/8". You can also specify a trim dimension, which will add the trim value to all dimensions when laying out the project. At the end, you can print out a cut list with each part numbered (or alphabetical id) and ACTUAL (not dimensional) measurements; a pick list for shopping; and the cut diagrams. I'm not sure that the program always determines the least number of cuts for a given project, but whatever it does generate will work... See the example below, where I am sure I could come up with an arrangement requiring fewer cuts on the first sheet. Of course, if you have a non-rectangular piece, the best you can do is tell the program the size of the smallest rectangle that would encompass the piece. If many of your pieces are routinely non-rectangular, you MAY do better by hand. But the program can give you a good start. The tool can be tried out for free, but I found it well worth the $24.95 for the Commercial Edition, which has no limits on the number of parts you can have. The author is Todd Peterson and you can download the program from his website. Todd makes it very easy to upgrade to the next level of the program and all new versions are FREE. Todd keeps a good record of his customers - I received an email telling me of a new release of the program. Overall, CutList Plus is an easy-to-use program for helping layout projects. 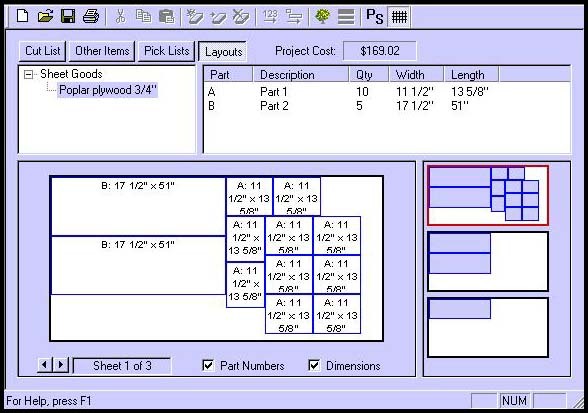 For very simple projects, it may not help, but for projects requiring several sheets, it can save a lot of time. However, I have had a couple of 'crashes' when resizing the cutlist window on my screen, so SAVE EARLY AND SAVE OFTEN. That way you won't lose your inputs. Editor's Note: Cutlist is for Windows. Mac users need Virtual PC.